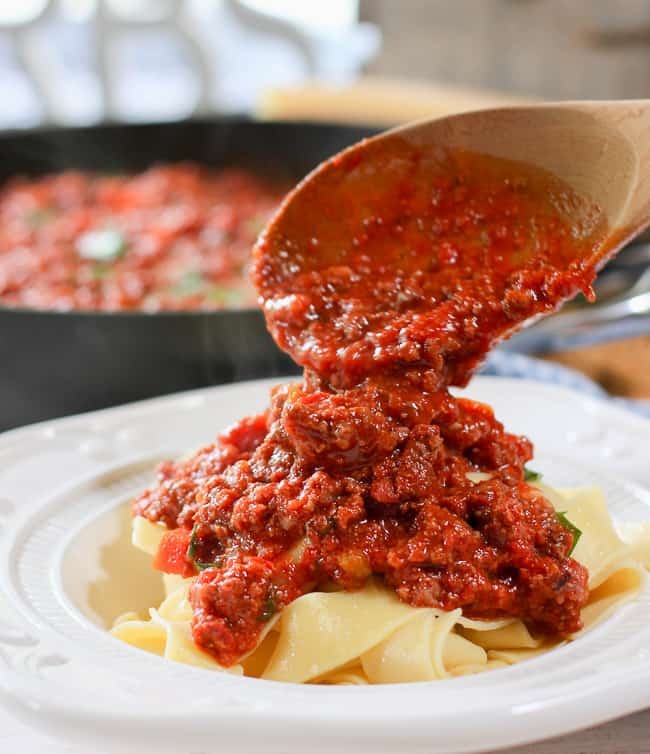 Classic Bolognese Sauce! 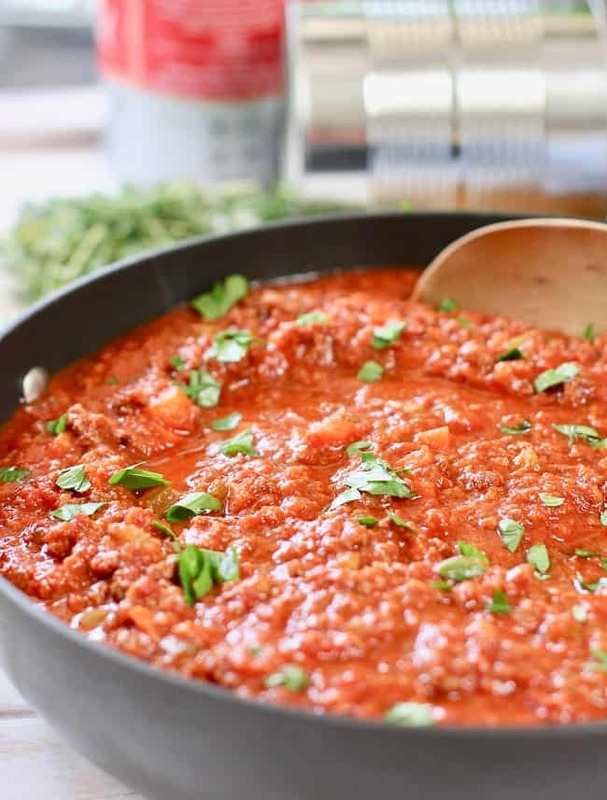 A rich and meaty sauce unlike regular spaghetti sauce. You have to try this to believe how good a simple sauce can be! Bolognese is a traditional Italian dish named after the place it was created, Bologna. It may sound fancy but it is incredibly easy to make! In order to extract every bit of flavor from this classic sauce, it requires a minimum of two hours cooking time. You can simmer on your stove top or in a slow cooker. 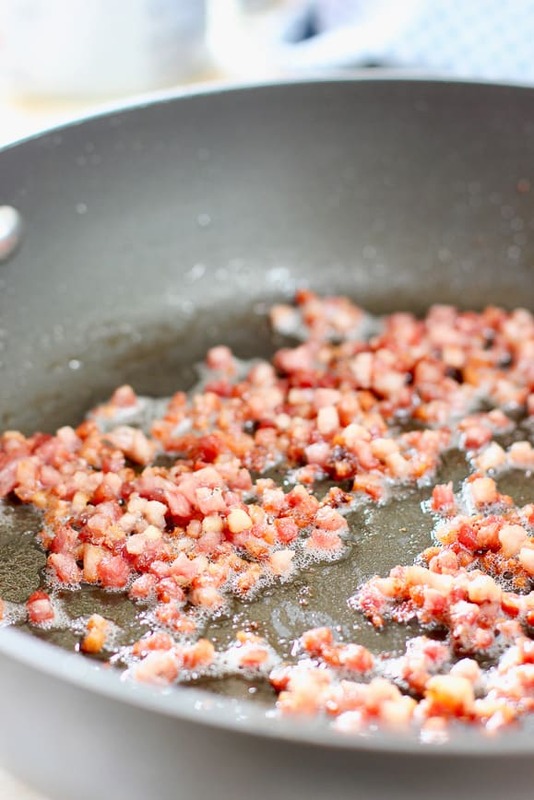 Start by rendering the fat from Pancetta, an unsmoked Italian meat product from the belly of the pig. Add carrots, onions and celery into the pot. Then your ground beef. A little trick: Use a potato masher to break up the meat. Bolognese traditionally uses very fine minced beef. I find an immersion blender works great for this. Simply run it through the pot after it has been simmering an hour or so. Just once around the pot will do it. Careful not to over do. If you don’t have an immersion blender you can add half of the bolognese to a food processor or blender then back to the pot. Or just leave it a bit on the meatier side. It all tastes great! Now pour in the tomatoes! We used San Marzano tomatoes. There are many good Italian tomato brands in most grocery stores these days. We like Cento in the bright yellow can and it’s easy to find. Now it’s time to simmer! This dish needs at least 2 hours to come together. I love having a pot of something cooking away while I putter around the house or watch a movie. And the aroma of this sauce will make your home smell like heaven! This recipe makes a very large batch of Classic Bolognese. Fill freezer bags of this sauce for cold nights when you want something comforting. We serve this over Pappardelle pasta. Ribbons of soft pasta with the most flavorful sauce spooned right over the top! 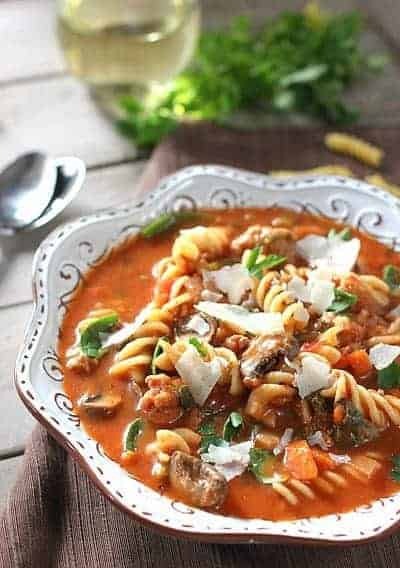 Italian and Sausage Soup – only 30 minutes from start to finish! Jarred marinara makes the broth super flavorful! Or how about an American and Italian combo! 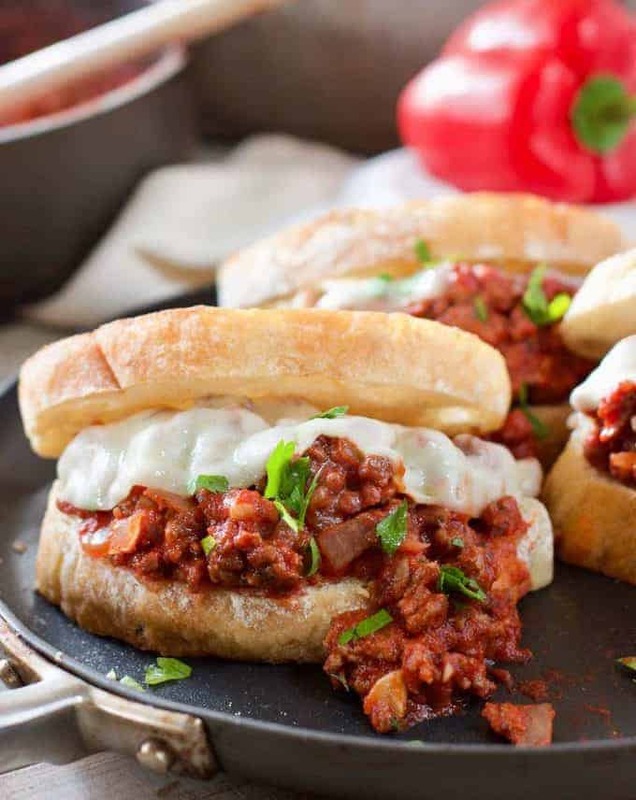 These Italian Sloppy Joes taste like that hunk of bread you dip into the spaghetti sauce…it’s the best bite! Over and over again! This Classic Bolognese will feed a crowd! 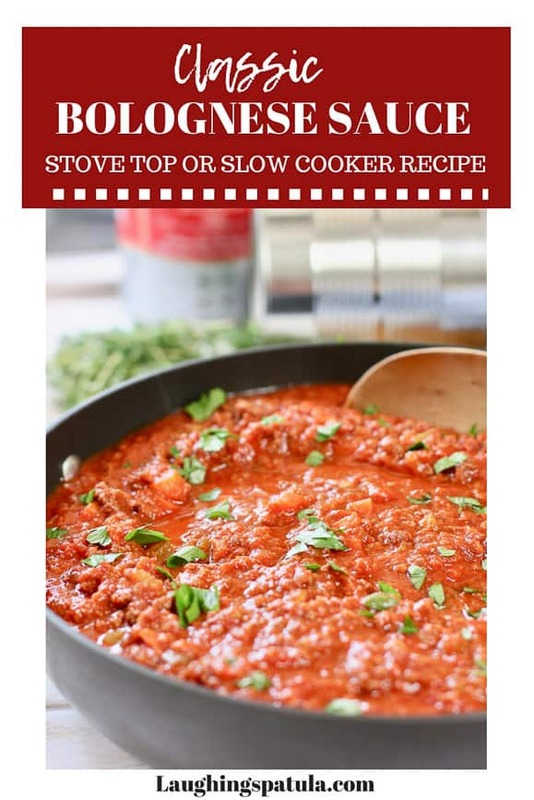 Make stove top or in a slow cooker. 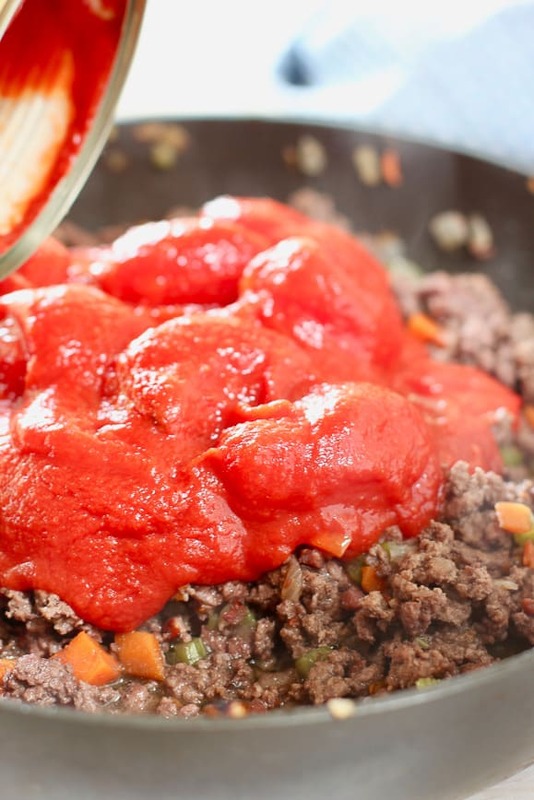 You will love the deep meaty flavor of this simple, authentic sauce! In large skillet or dutch oven brown the pancetta until crispy and all fat has rendered. Remove all but one tablespoon of the fat. To the pancetta, add olive oil, celery, onion and carrots. Saute until slightly tender. Add ground meat breaking up as it cooks. Continue to cook until meat is cooked through and browned. 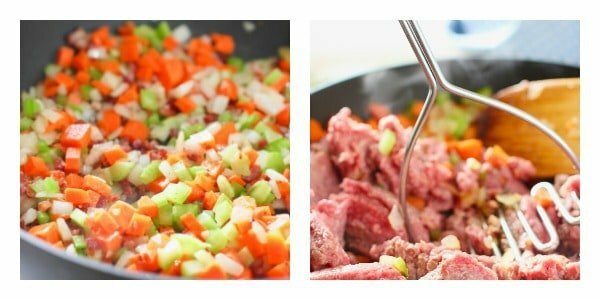 FOR SLOW COOKER: Add beef mixture to slow cooker and follow remaining steps. Add whole and crushed tomatoes, breaking up the whole tomatoes with your hands or a wooden spoon. Add red wine and milk. Bring to a simmer and cook for two hours. (or low setting of slow cooker for 4-5 hours, high setting for 2 hours). TASTE FOR SALT and PEPPER. If you prefer a finer texture to your bolognese, simply run an immersion blender through the pot for a minute or two, after it has been simmering for about an hour. Either thicker or finer this sauce is delicious! Bring a large pot of salted water to a boil. Cook your pasta according to package directions. Serve Bolognese over cooked pasta and top with fresh grated parmesan cheese. I made this last night. I also added (to the Pancetta) diced pepperoni and diced hard salami) and added oregano, rosemary and a heaping tablespoon of garlic. The harder meats get very tender when I simmered in a dutch oven for 2.5 hours. It tastes (and I mean this in a VERY GOOD way) exactly like the Meat Sauce they use in Stouffers Meat Lovers Lasagna! It was a teensey bit too soupy for me, even with the crushed tomatoes and all the meats……so I added a Cornstarch slurry. What kind of red wine do you use? I dont drink wine, so I have no clue what to get. Merlot, cabernet or red table wine will work. Make sure it’s a decent wine. 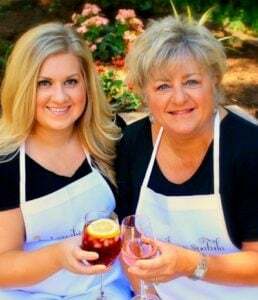 If the wine is bad, you will ruin the dish. You can also forgo the wine and substitute with beef stock if you prefer. It will change the flavor profile but still be delicious! How would it be without milk? I’m lactose intolerant. Hi! Thank you for these amazing recipes. I can’t wait to make the bolognese sauce! I have two questions. First, do we use EITHER whole milk, or half and half…what amount do i use of the half and half? I just wanted to confirm this, as I want it to turn out perfectly. I’m assuming it says 1/2 Cup Milk, OR 1/2 Cup Half-n-half – is that correct? Secondly, where do you buy your whole and crushed tomatoes from? I googled it and looked on amazon, and most pricing was selling them in quantities of 4, 6, or 8 cans in an order – which I really don’t need 6 cans of whole tomatoes. I did find a brand on Amazon that only costs $3.90 per can, but it’s only for a 14.1 ounce can. I found the same thing with the crushed tomatoes. Shipping was another $7+. Where did you buy yours from? 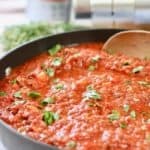 I really want to use those types of tomatoes so I was hoping you can give me some direction of where I can buy them from? If you use a slow cooker when do toy ad the half and half or milk? Step #4. Add it with the wine then right into the slow cooker. (you don’t have to wait until after it’s cooked). the pictures look like you drain the contents if the can of tomatos. is that the case? Correct Steve! You could add them if you want, of course. But you might find adding them makes it taste like spaghetti sauce and not beefy tomato Bolognese. Good question!